They certainly don’t build them like Castello di Carimate anymore, and for that we are all the poorer. This four-star hotel welcomes discerning guests from all over the globe, continuing a tradition which has included King Umberto I (1877 and 1885), and Emperor Massimilano I d'Asburgo in 1493. The icing on its historical cake is, perhaps, that it was originally built in the 12th century. 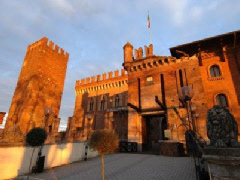 Four-star classified, Castello di Carimate boasts a swimming pool, Turkish bath, fitness centre, restaurant, and a bar. Milan is just a few miles to the south, while Como is even closer to hand to the north.